Have you heard this one before? I read it somewhere on Facebook today and I had to laugh. If only . . . . I thought. Running has been by leaps and bounds the most expensive undertaking I have ever, well, undertook. Next to raising kids . . . maybe. For me it's not even the gear. 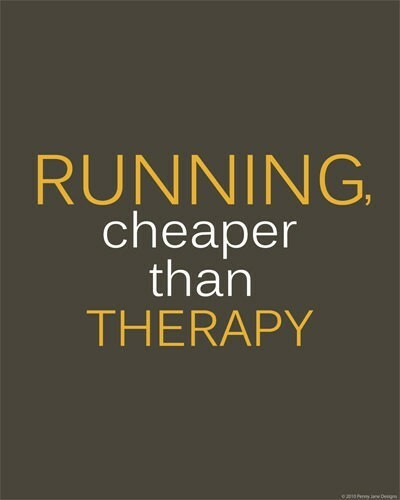 Everyone likes to say that running is a cheap sport, but not really. Not if you like the shoes and watches and the clothes and the socks and the water bottles and and and and. But it's not that. It's that when you are a runner, and you are perpetually injured, the amount of money it takes to get help is pretty shocking. Even with insurance. The physical therapy appointments, the massage appointments, the specialists, the gear specifically for treating injuries, it ain't cheap folks. 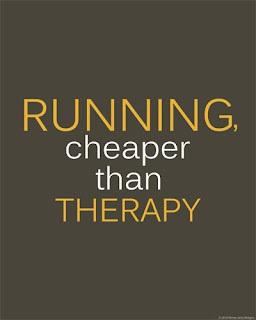 If we couldn't afford it, I literally would not be running anymore. I would be too injured, and too broke, to run at all. And things brings me to my PT appointment this week. My usual PT was on maternity leave for what seemed to me like an enternity, and I finally got to see her again yesterday. One of the very first things she noted about me way back last July when I first saw her was that I had an unstable pelvis. And yesterday? She discovered it's still giving me problems. Here I thought with all of the exercises I have done, all of the strength training, all of the cleaning up my form, I thought my pelvis was golden. Nope. In that respect I am back to square one. Or still at square one? Not sure. What is an unstable pelvis you ask? When I run, or squat, or stand on one leg, or whathaveyou, my pelvis goes all skeewampus instead of staying level. And what does an unstable pelvis do when I run? Fix Your Run has an answer to that. And yes, I look like that first picture when I run, apparently no matter how hard I try not to. While I don't think fixing this issue is going to cure all that ails me, I think it's a start. At least, I hope so. This week I also am going to see an orthopedic specialist who will hopefully look at my entire system to see if there is anything else that isn't sports-related that is contributing to my constant injuries. I am keeping my fingers crossed! One other thing that my PT tried, which I am not sure if it helped at all, is something called ASTYM. If you haven't heard of this, it is a treatment where the therapist uses these funny little plastic tools and runs them over your muscles to help encourage the scar tissue to break up and to start behaving nicely. My PT described it as if the muscles were all knotted up like cooked spaghetti, ASTYM helps them to lay nice and orderly and flat again like dry, uncooked noodles. Now, I just had this done once, on my cranky hamstring area, and I feel no different. Not sure what that means! I am definitely willing to try it again, though, especially on my feet and my IT band, which I heard it works well on. Have you ever tried ASTYM? Ever had an unstable pelvis? Any success stories to share of overcoming a mountain of injuries? Huh, I have never dealt with that. Of course I broke my pelvic when I was 18 so having it pinned together might have something to do with it. I hope they can figure something out.